Our hopes of having juicy , cheap Oranges in the Orange city – Nagpur had already dashed when the locals told us that the crop this year was not very good. “So what else to see here”, I thought out aloud. “Nagpur is the centre-most place of India”, Ankit updated me. “And there is a point which is geographical center of our nation”. The explorer in me was excited. Something new, something worthy to see. So on the last evening there, with help of some directions over phone from Sanchit we left to find the center of India. We asked the taxi driver to take us to “Center point”. “Center Point hotel?”, he asked. “No. The center point of India”. Some more on-phone enquiry led us to Sadar Bazaar area in front of a huge Blackberry showroom where three roads diverged (Later we actually took the one less travelled). The guard of the showroom was asked the same question about “Center point of India”. No answers again! Finally the showroom manager guided us and let us know that it is called “Zero Mile”. With a new name and renewed hope of witnessing a historical moment of our lives, we started walking. Finally on emerging on to a major road, we were informed that the next traffic crossing is the Zero Mile. Eagerly, we reached there but the only thing magnificent there was the huge RBI building. The hopes were coming down and the body was tiring but then we saw a huge pan masala hoarding, one of many in Nagpur at that time which said, “Shauq bade cheez hai“. Motivated, more inquiries were made and we walked to the next crossing. 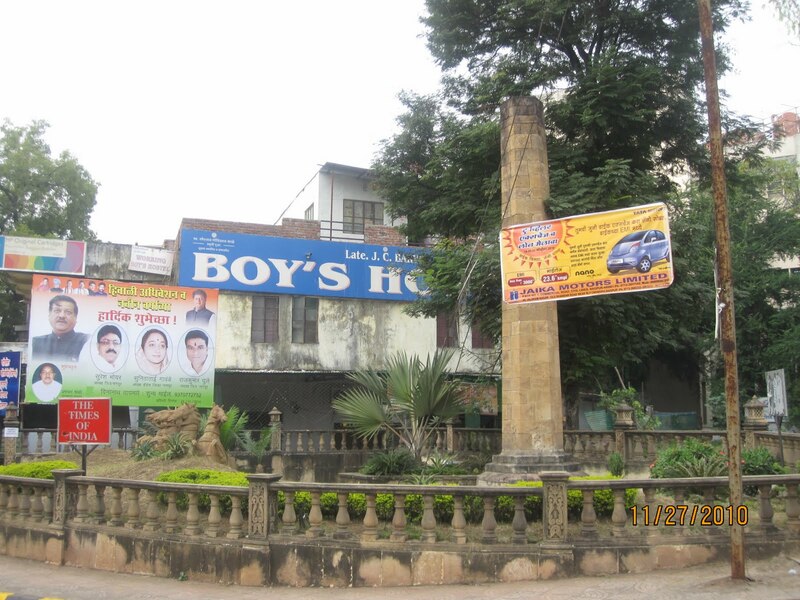 Standing discreetly, discarded and forgotten, in a dark corner of a busy intersection was the pillar which is the geographic center of India. A nearby building formed one of its boundary wall and various political and advertising banners surrounded it. From no angle it looked like an important monument of India. Ankit actually didn’t believe that this was it. Finally a shopkeeper nearby confirmed it. We jumped the small boundary wall into the compound, all the while trying to find our way using the Mobile’s light and then had our two minutes of fame of standing right at the center of India. The pillar had its usual “A loves B” with arrow pierced heart signifying the ‘Love’. At the bottom of the pillar, distances of some cities were marked. Hyderabad was the only known one. We couldn’t click any photographs and came back for a quick visit the next day when the light was still in favor. Interestingly, the Zero Mile Stone/Pillar was in news in 2008 when it was renovated and dedicated to the citizens of Nagpur (whatever that means). Times of India took the responsibility of maintaining it for five years. May be the definition of maintenance encompassed only cutting the grass in the small compound. MOIL (ya the same which gave 50% returns in IPO yesterday) had undertaken the maintenance responsibility initially but was barred by the Municipal Corporation as it put up a banner showing distance of different cities from that point. May be that banner was much better than the present banners showcasing ugly politicians and in all probability put up by the MC. (On a side note, ToI’s photo gallery of the dedication ceremony doesn’t have a single photograph of the pillar with which the present condition can be compared. Photos of only people who attended the ceremony). A ToI article explaining the state of neglect before it took over.